The East Lancashire Liverpool to Manchester road passes within a few hundred yards of the northern boundary of the Urban District (four main roads communicating between Newton-le-Willows and this, important arterial road) and the Warrington to Wigan trunk road, leading on to Preston and the North, passes through it. 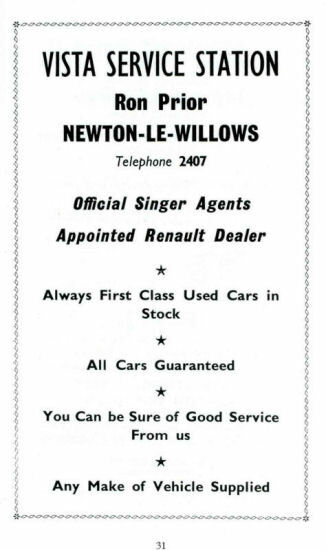 Newton-le-Willows is six and a quarter miles from Warrington, eight miles from Wigan and four and a half miles from St. Helens. Omnibus services are operated by the Lancashire United Transport Limited, and excellent transport facilities are provided to all surrounding districts and large towns. It will be seen that the District is very conveniently situated for road transport. In addition to being situated on the main Liverpool-Manchester railway line, the Urban District is on the main north-south line and Earlestown is regarded as an important railway junction. 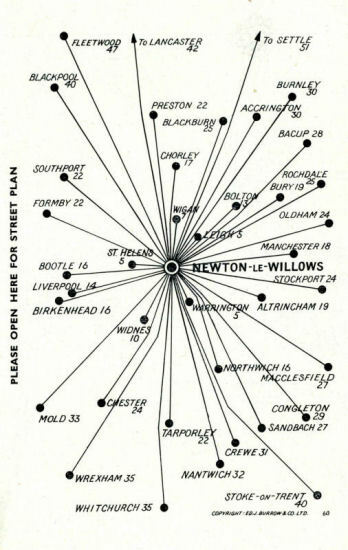 There are railway passenger and goods stations at Earlestown and Newton-le-Willows and the frequent express trains which operate between Liverpool, Manchester and Yorkshire invariably stop at one or other of these stations. 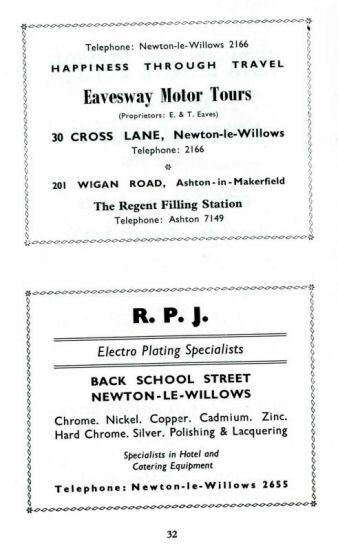 Railway communication with Warrington, St. Helens, Wigan and Leigh is by main line from Earlestown and Newton-le-Willows. 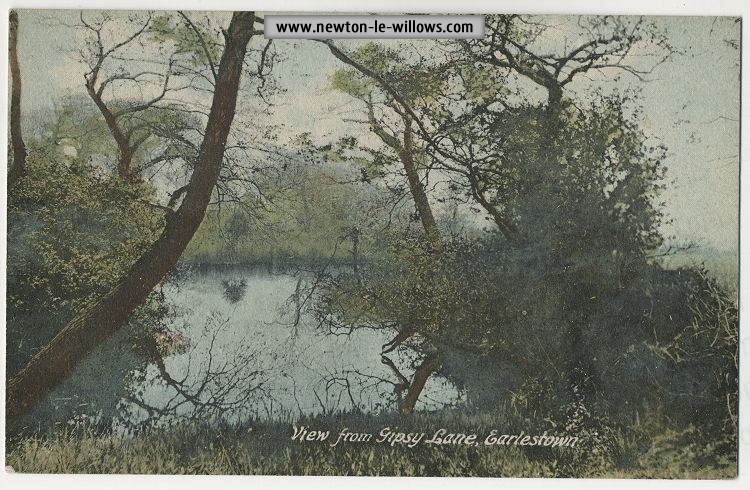 The Warrington-St. Helens canal is navigable as far as Earlestown and is regularly used for conveyance of goods between Warrington, where it joins the River Mersey, and the Sankey Sugar Works. 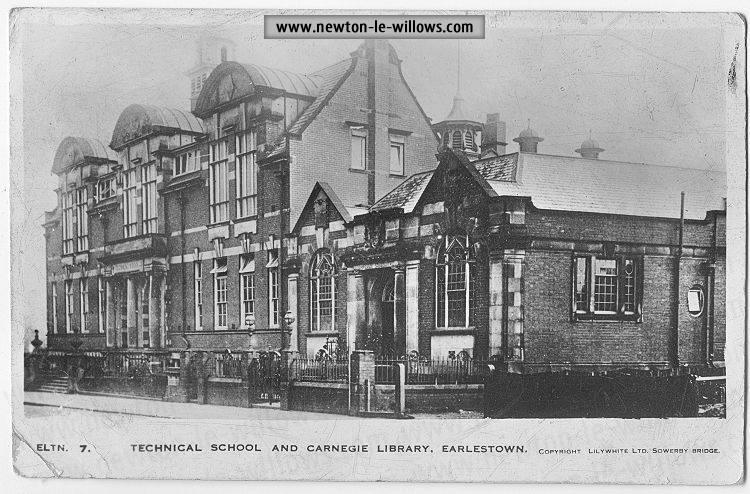 There are two main centres of population in the Urban District, Earlestown at the west, and Newton at the east, but the intervening part has been so developed in recent years that the two centres are now merged. 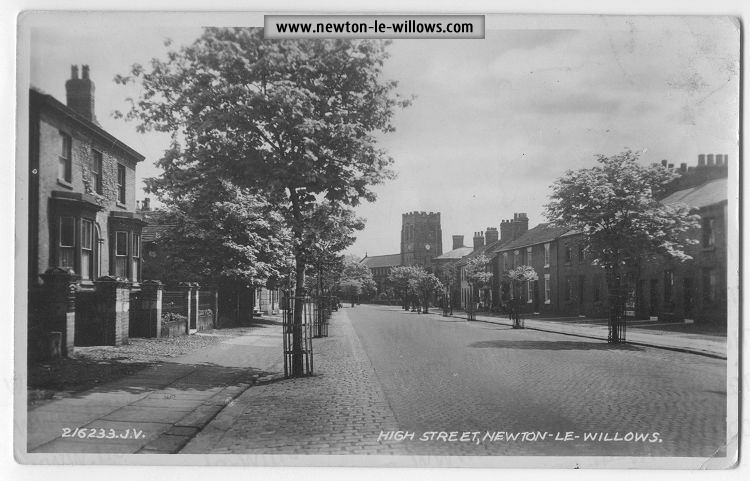 The older centre is Newton, which is residential and of considerable antiquity. 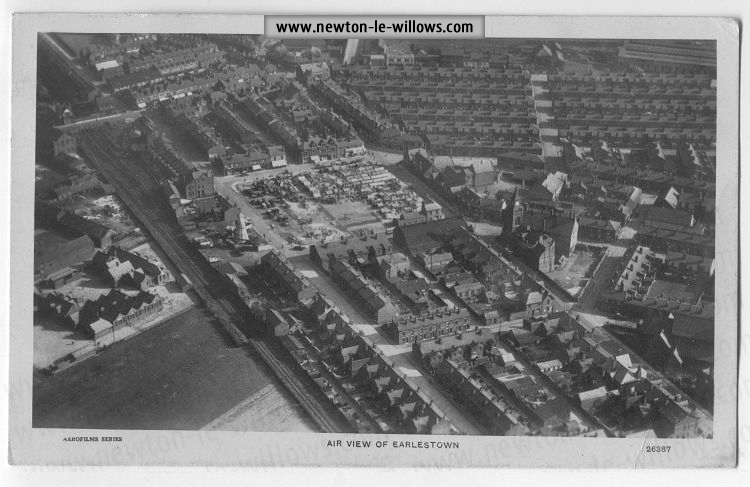 Earlestown is of later origin, mostly industrial, and is the Urban District’s commercial and shopping centre. The Urban District is surrounded almost entirely by open farming country. 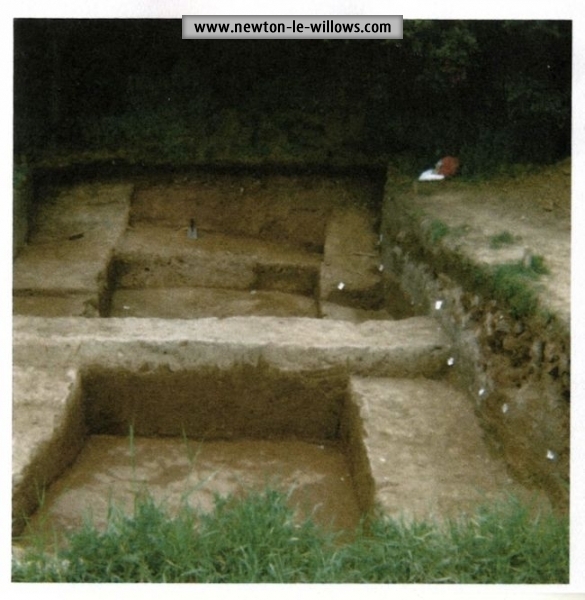 Newton was a Paramount Manor in the Domesday Book, where it was referred to as "The Hundred of Neweton," and later became known as "The Fee of Makerfield." The Fee of Makerfield fell to Richard of Poicton, who conferred it upon Richard Banastre. From the Banastres the Barony descended about 1296 by marriage to John de Langton (who was knighted by King Edward I) and who later procured a Charter on the 14th February, 1301, from King Edward II for Markets, Fairs and Free Warrene in Newton-in-Makerfield. 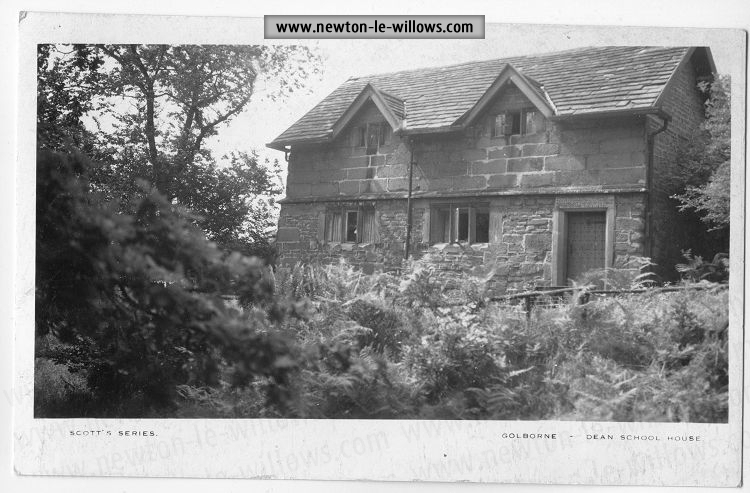 From the Langtons, Newton passed in 1604 to Sir Richard Fleetwood, Bart., who soon sold the Manor, Borough and Barony of Newton and the Fee of Makerfield with all its messuages to Richard Legh. The Borough was never incorporated and was a Close or Proprietory Borough. 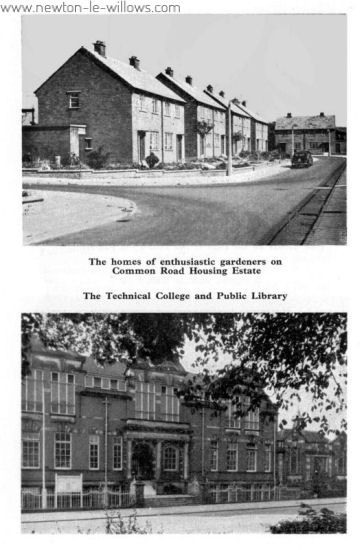 By descent the Manor and Barony came in 1857 to Mr. William John Legh, who represented South Lancashire and East Cheshire in Parliament at various times, and was created Baron Newton of Newton-in-Makerfield in 1892. At the Parliament which met in the first year of the reign of Queen Elizabeth, 23rd January, 1559, Newton was added, together with Clitheroe, to the list of Boroughs returning Members of Parliament for Lancashire, namely, Preston, Wigan, Liverpool and Lancaster. 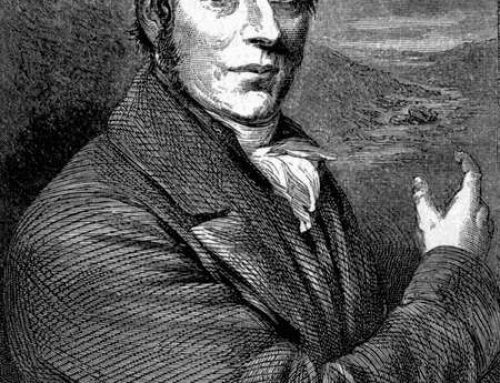 With a brief exception during the Commonwealth this continued, with the County representation, to be the strength of Lancashire’s Parliamentary representation, until the passing of the Reform Act, 1832, when Newton was disfranchised and included in the South Lancashire Division. 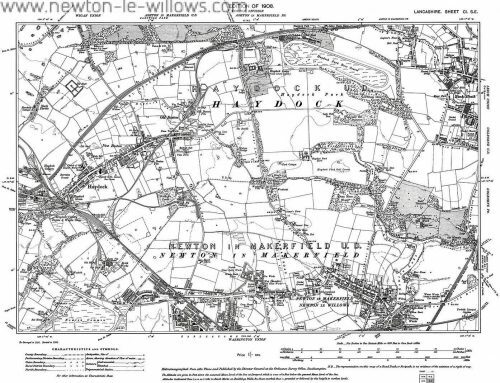 Newton-in-Makerfield became an Improvement Act District by the Newton District Improvement Act, 1855, and was created an Urban District under that name under the provisions of the Local Government Act, 1894. 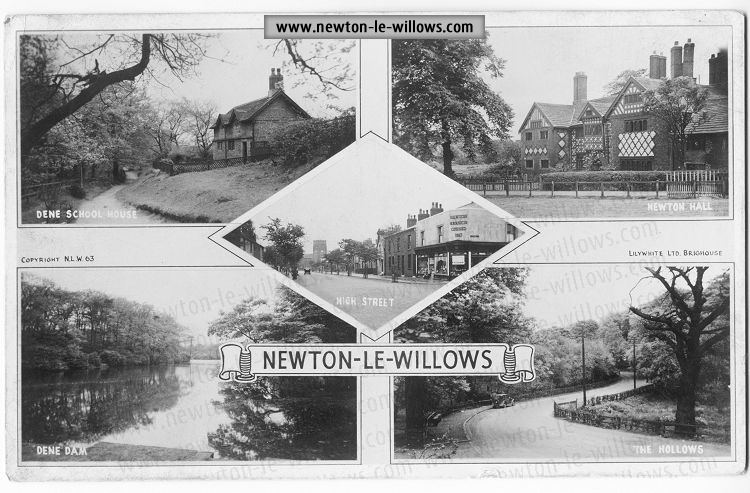 Under the Re-distribution of Seats Act, 1895, Newton gave its name to one of the Parliamentary Divisions of the County. 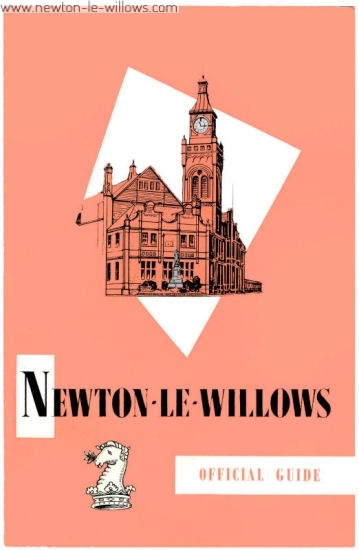 The name of the Urban District was Newton-in-Makerfield until 1st March, 1939, when it was changed, at the request of the Council, and by an Order of the Lancashire County Council, to Newton-le-Willows. 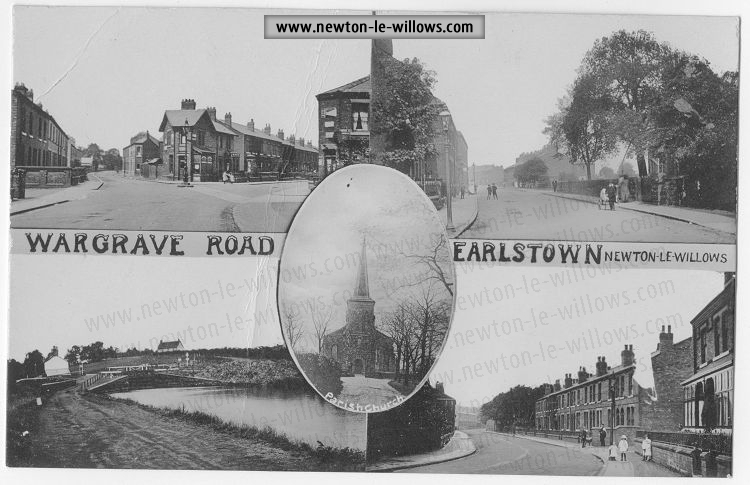 Earlestown, at the western end of the urban district, is of later origin than Newton and its population is of greater density. 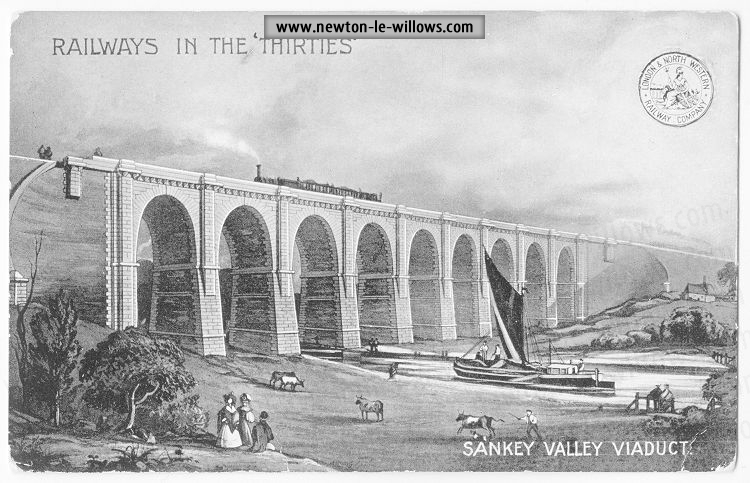 It owes its rise to the construction of the Liverpool-Manchester railway under the supervision of George Stephenson, and was a most important centre of operations during the construction of the railway. Its favourable situation led to its being chosen as the Wagon Building and Repair Works of the London Midland and Scottish Railway Company which has developed into an extremely large and important factory of British Railways ; and to the foundation of the Engineering and Locomotive Works of the Vulcan Foundry in the early 1830’s by George Stephenson’s partner, Edward Tayleur. Vulcan Village, which is occupied by the foundry’s workmen, is nearby. 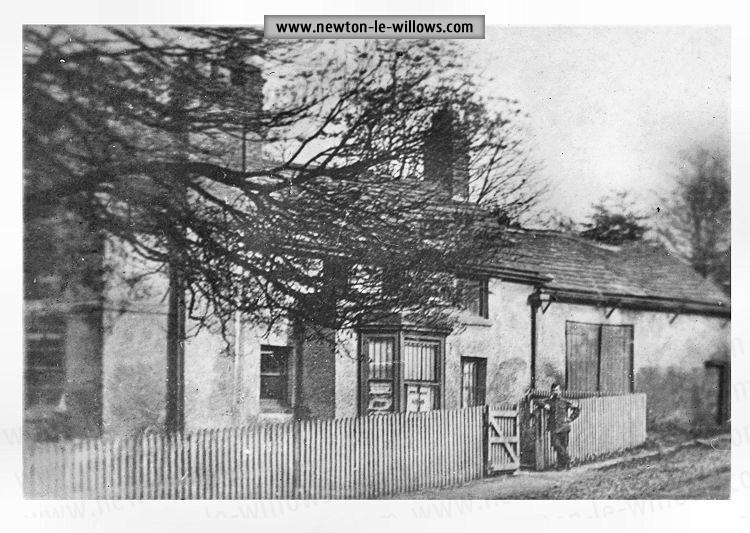 "In 1855," to quote from a local newspaper, "an improvement bill was hurried through the Houses of Parliament handing over Newton to the tender mercies of a board of commissioners whose powers enable them to sewer the town, repair and pave the roads and provide gas and water." As previously mentioned, the district became an Urban District in 1894 under the provisions of the Local Government Act of that year. The present Council comprises fifteen members and they meet on the first Tuesday in each month at the Town Hall, Market Street. The District is divided into five Wards and each Ward is represented by three members. 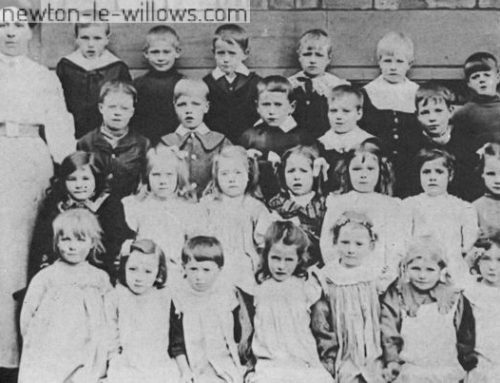 The Education Services in Newton-le-Willows are administered by the Lancashire County Council through a Divisional Executive Committee whose offices are situated at "Wellesley House," Crow Lane West, Newton-le-Willows. The District is well provided with schools and has a fine Grammar School and a College of Further Education and Junior Technical School. This is a co-educational establishment conducted on thoroughly up-to-date lines by a fully qualified, college trained Staff of wide experience. A sound education is imparted to pupils between four and twelve years, and on reaching the age of eleven pupils are entered for Entrance Examinations for Secondary and Public Schools. The curriculum is comprehensive, the surroundings are pleasant; there is ample scope for physical training and sports and individual tuition is assured. 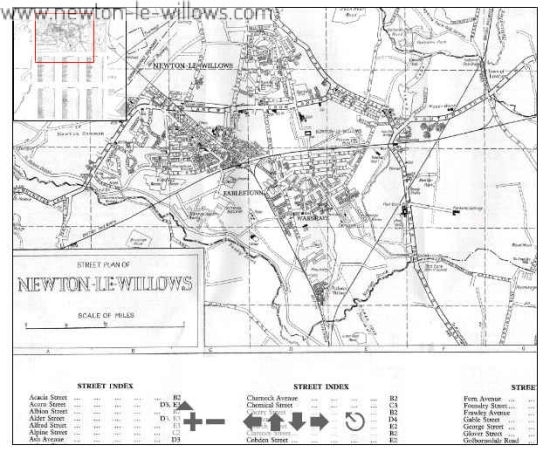 Newton-le-Willows is incorporated in the Health Division No. 10 of the Lancashire County Council. The Divisional Medical Officer of Health whose office is at the Old Rectory, Winwick, near Warrington will be pleased to supply information about the many services provided. 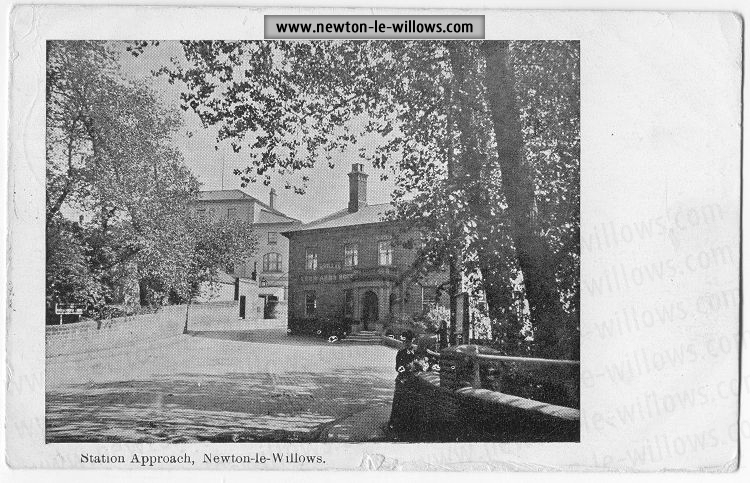 The Newton-le-Willows Cottage Hospital provides treatment for general surgical, gynaecological and medical cases. The Hospital is administered by the Warrington and District Hospital Management Committee. The Council are proud of their record in providing houses at very favourable rents. 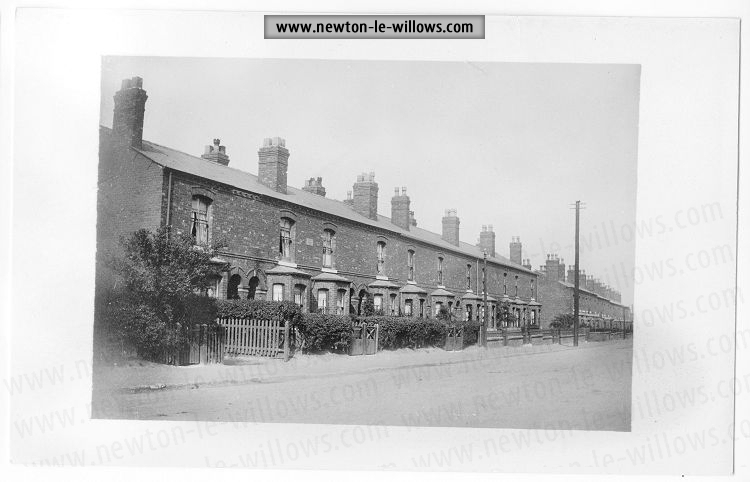 Over 1,000 have been erected since the War and the Council now own approximately 2,500 dwellings. The Council have completed their first five-year programing for ridding the District of unfit houses and have pledged themselves to a policy of providing good accommodation for all the population. Particular emphasis is placed on the housing needs of the aged and with the co-operation of the Lancashire County Council special schemes have been undertaken. There are many private developers in the Urban District who can offer for sale all types of dwellings on pleasing sites. library is provided at Vulcan Village. The Council own an exceptionally good Market Square and open air Markets are held every Friday. Earlestown, Thursday afternoon. Newton, Wednesday afternoon. The Council are the statutory water undertakers for the urban district and also supply water in bulk to part of the Golborne Urban District. The water is drawn from deep wells and is of good quality. The water rate and charges are very favourable. 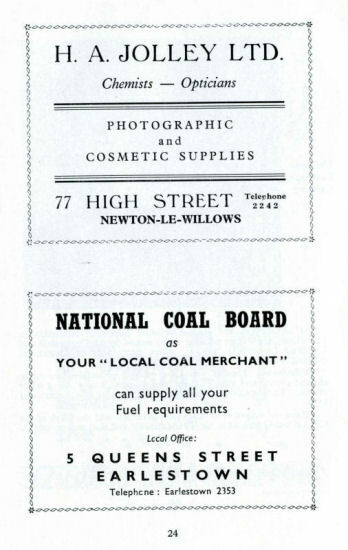 The North Western Electricity Board supply electricity and have showrooms and offices at Bridge Street and High Street. Gas is supplied by the North Western Gas Board. 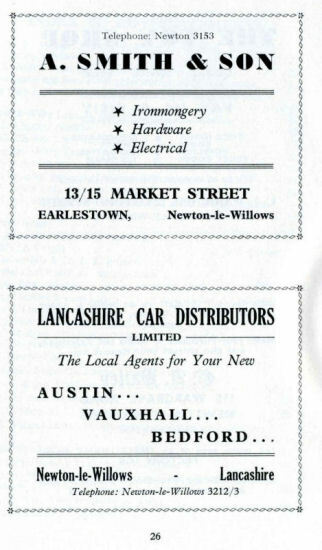 The Gas Showroom and offices are in Queen Street. 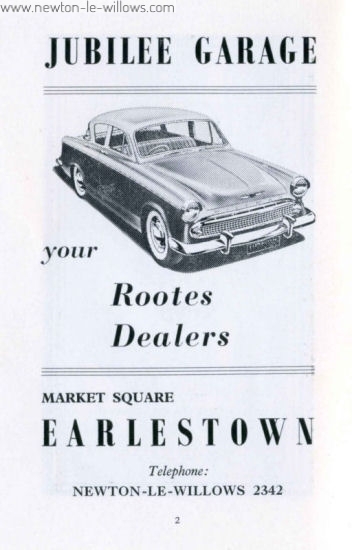 Earlestown is a good shopping centre where all goods and services may easily be obtained. The District Bank, Westminster Bank, Barclays Bank, Co-operative Wholesale Society Limited and the Warrington Trustee Savings Bank have branches in the district. The Church of England has four Parish Churches and a Mission Church: Wargrave, Wargrave Road ; St. Peter’s, High Street ; St. John’s, Market Street ; All Saints’, Crow Lane East; and St. Phillip’s Mission Church, Common Road. 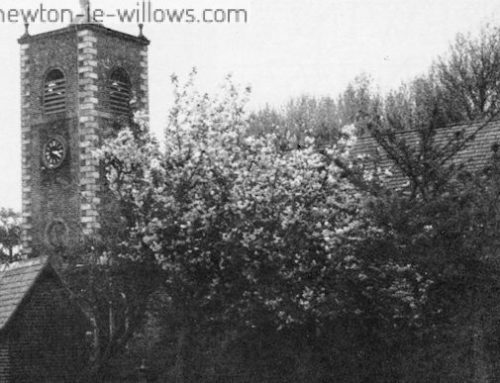 There are two Roman Catholic Churches : St. Mary’s and St. John’s, Crow Lane East and St. Patrick’s, Common Road. 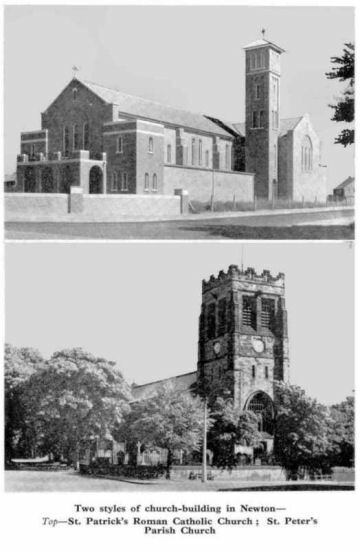 A Congregational Church in Crow Lane East ; Methodist Churches at Cross Lane and at Legh Street; a Baptist Church at Crown Street and a Church of Christ Scientist in Heather Brae. Excellent facilities for sports are available. The Council own approximately seventy acres of parks and open spaces and at King George’s Field three football pitches and cricket pitches are available. 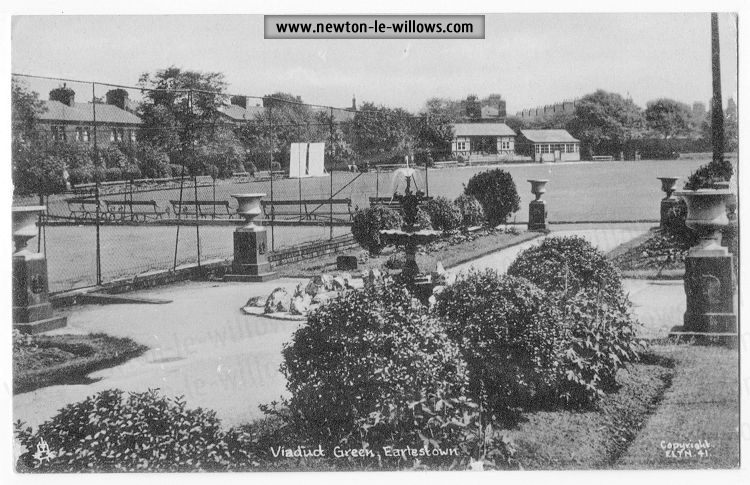 The Newton-le-Willows Cricket, Bowling, Tennis and Rugby Club has extensive premises and a pavilion off Crow Lane East. 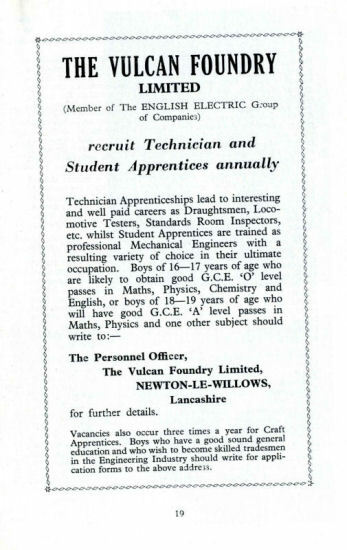 The Viaduct Institute, Earle Street, The Vulcan Foundry Limited and other industrial firms provide similar facilities. 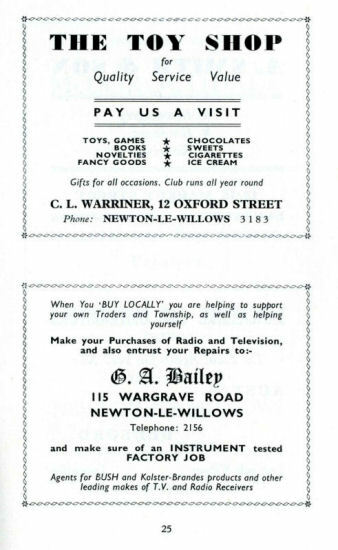 There are many crown green bowling clubs. The Earlestown Football Club, Vista Road play in the Lancashire Combination. There is a Golf Course at Haydock Park. Race meetings are held regularly at the Haydock Park Course. 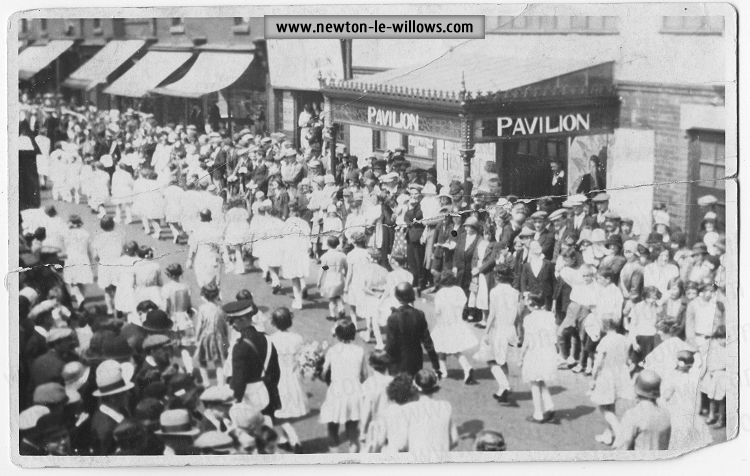 The district is well served by its local amateur theatrical organistions which stage excellent productions at the Town Hall, Market Street. 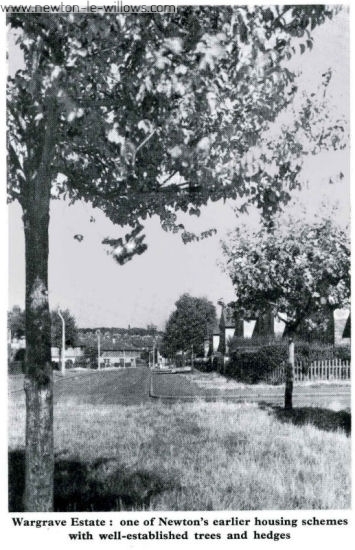 Laurel Bank, Legh Arms and Pied Bull, High Street. General, 19s. Od. Water, 1 s. 2d. A comprehensive list of the many societies and organisations may be had from the Clerk of the Council. The Council own two Town Halls which are available for letting. Applications should be made to the Clerk of the Council. Clerk and Chief Financial Officer J. Roberts, A.R.V.A. Engineer and Surveyor J. G. Gibson, M.B.E., M.I.MUN.E. Medical Officer of Health Dr. A. C. Crawford, T.D., M.B., CH.B. D.T.M., D.P.H. Chief Public Health Inspector L. M. Booth, M.A.P.H.I., M.R.S.H. Librarian D. W. Prescott, B.A., F.L.A. Collector and Market Superintendent A. Lennox. General Post Office, High Street. 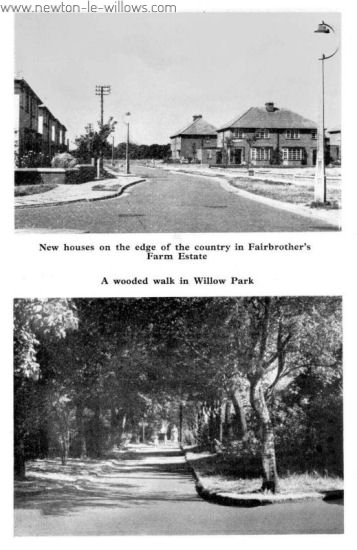 Sub-Offices : Earle Street ; Crow Lane West ; Crow Lane East ; Wargrave Road ; Vulcan ; Mill Lane. 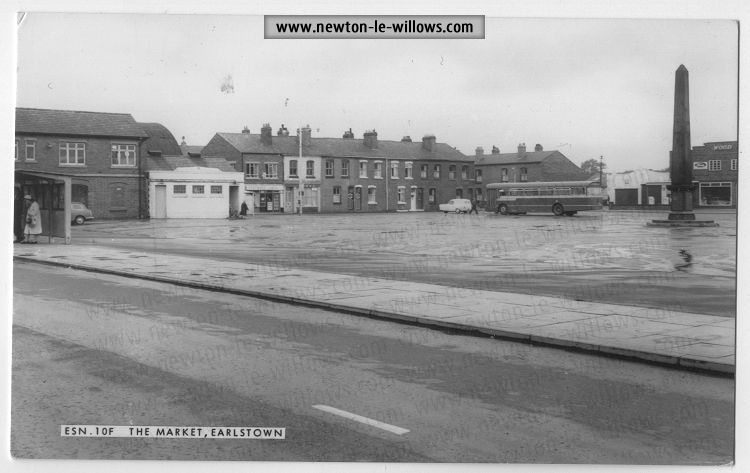 Earlestown Station, Queen Street (for main services) ; Newton-le-Willows, Mill Lane ; Vulcan (for local service). Rather more than a century ago, an eminent topographer could already record of Newton that " many important works are carried on in its vicinity." 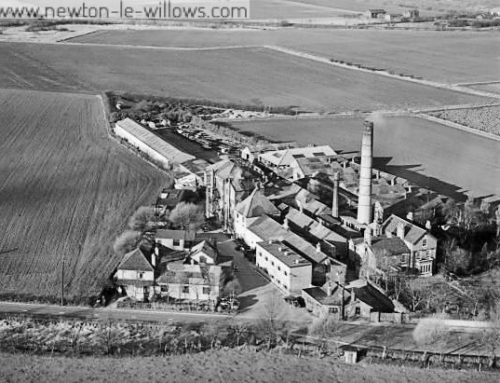 The two locomotive foundries which remain today employed between 700 and 800 hands ; an alkali works employed nearly 300, and produced one of the earliest types of chemical fertiliser invented by Baron Liebig ; and there was " an establishment for the manufacture of crown-glass." There were sandstone quarries, and agriculture flourished. The land was evidently excellent for grazing for there were two horse fairs yearly and two fairs for "horned cattle," and Thomas Legh, the lord of the manor, had built a market-house in 1840. Altogether, there was an unusually wide choice of employment in the town. 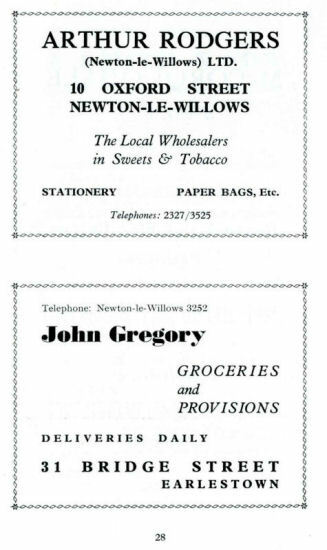 Several old-established businesses from the great cities of South Lancashire moved into Newton ; and the very year that the town’s board of commissioners were appointed, the big sugar refinery was set up. The railways and the canal were the great influences in attracting industry, by providing ease of transport. 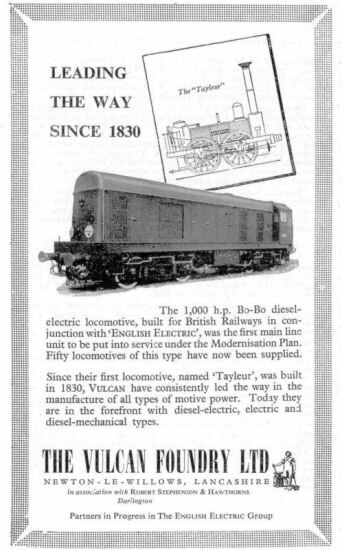 Today, the British Railways factory is a large and important one, and the Vulcan Foundry produces the latest types of locomotives as it did in 1830! 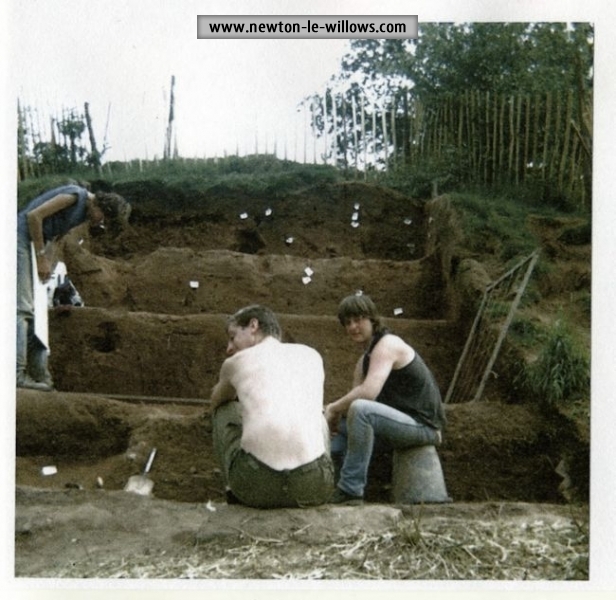 The Vulcan Foundry was built (according to the land-lease in the company’s possession) on the " Low Fir Field . . . the Big Heath Field, the Rye Field . . . " a far cry from the Works today, now part of the English Electric Group of Companies and re-equipped to meet the new demand for electric and diesel-electric locomotives. Two years ago the Foundry handed over, at the Newton-le-Willows works, the first locomotive to be supplied to British Railways under their great modernisation scheme. 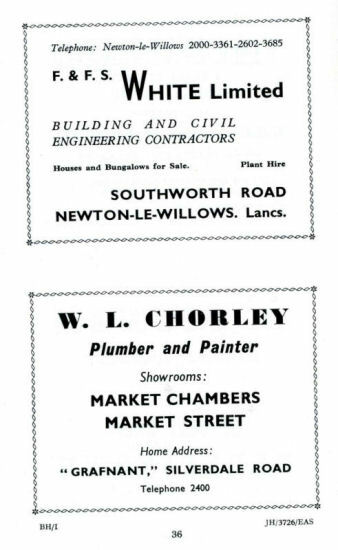 The works, midway between Earlestown and Newton, occupy an area of eighty-seven acres, of which over fifteen acres are covered by spacious, airy and well-lighted buildings. A complete section of the works the former Tender and Automatic Shops has been entirely reorganised for the bulk manufacture and testing of English Electric diesel engines. Some figures : The Wheel Bay has a 200-ton wheel press and the capacity of the travelling cranes ranges from five to fifty tons. This is, indeed, heavy industry. Progress and development are continually being pursued and research activities are centralised in an ample laboratory containing sections for mechanical testing, radiography metallurgy and chemical analysis. There are comprehensive apprenticeship schemes and the staff amenities are among the best in the North of England. Vulcan give training in locomotive engineering to a limited number of students from overseas. 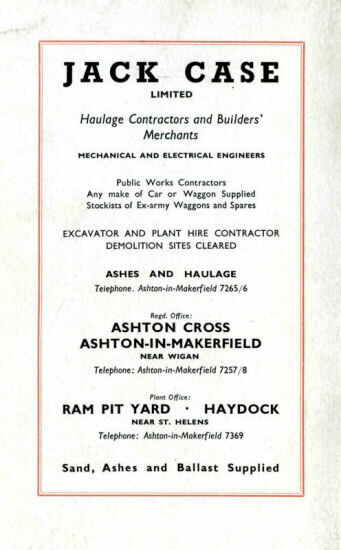 The National Coal Board are developing the new Parkside Colliery which is expected to be in production during 1961. The Colliery is one of two large new collieries planned for the Lancashire coal field and will produce a million tons a year. 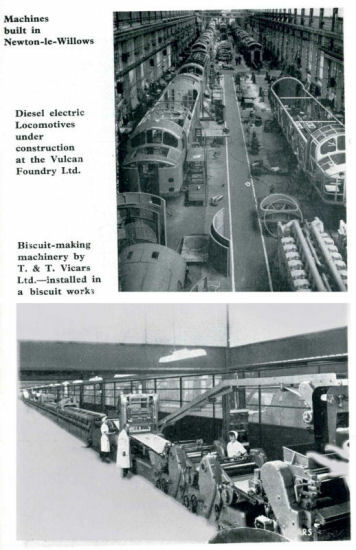 At a ceremony marking the completion of two shafts in February, 1959, the deputy chairman of the National Coal Board, Mr. Joseph Latham, said : " We are glad that we are able to initiate big projects which will provide employment and prosperity in Lancashire in the future." Parkside colliery, which is one of the Coal Board’s most important new pits, will employ 2,200 men. By the end of 1962 it will be producing 2,000 tons of coal a day, and full production of 4,000 tons a day will be reached in 1965. Already records have been made there. The two shafts were sunk in record time, using new techniques introduced by a firm of South African mining engineers. A team of 120 workmen—all recruited locally	completed the concrete shell of a 191ft. bin. winding tower in twenty days, one hour. The second winding tower, 14ft. higher than the first, was completed in eighteen days. The Coal Board sees Parkside as a symbol of its determination and ability to produce coal efficiently. With Parkside’s help, the Board will make the most of the coal available in the Newton-le-Willows area, and it will be able to offer new jobs to men displaced as the older pits become exhausted. 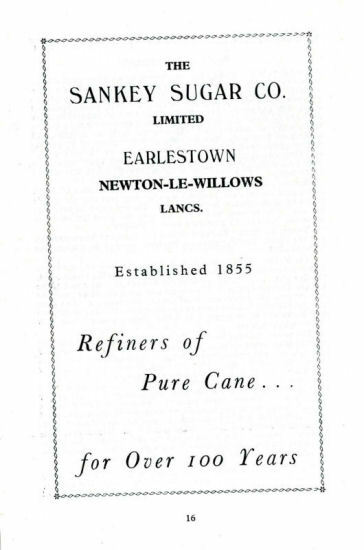 The Sankey Sugar Co. Ltd., have extensive premises on the banks of the St. Helens Canal. Along this Canal thousands of tons of raw cane sugar are brought from Liverpool for refining. On arrival the raw cane sugar is taken into the refinery to be convened into the finished white product for table use, and the manufacture of jams, sweets, and many other articles of food. In the refinery, the first process is to wash the raw sugar crystals to remove the molasses adhering to the crystals. These crystals are next dissolved in water and passed through a filtration process to remove pieces of grit, fibres, sand, insects and other impurities. After this the solution is "decolourised," i.e. treated with carbon or charcoal to remove colour and smell. Then it is again filtered through a very fine cloth, and the resultant solution is a brilliant colourless and odourless liquid. This liquid is concentrated in a "vacuum pan" until crystals form. These crystals are separated from the liquid, sterilised, and dried, and packed into bags of various sizes. A very large proportion of the work is carried out automaticall by machinery, and great care is taken so that impurities shall not enter the sugar. The refinery has specialised for over a century in the production of refined pure cane sugar both for the housewife and for the largest manufacturer. About one million one-pound and two-pound packets are produced each week for the domestic user, whilst for the manufacturer a full range of sugars is available in paper sacks or jute bags. For the larger manufacturer, deliveries of granulated cane or liquid cane sugar are made in bulk sugar road tankers which carry up to fifteen tons of cane sugar. 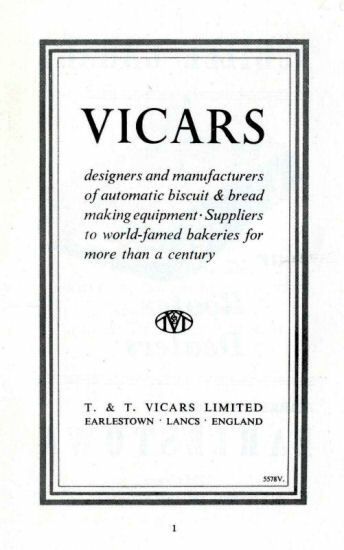 T. & T. Vicars Ltd, are important manufacturers of machinery for the biscuit industry. 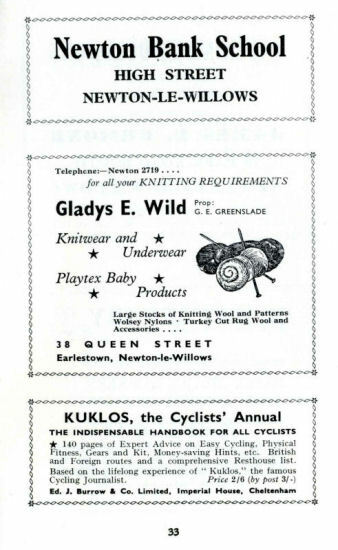 The company was founded in 1849, through a partnership of two cousins, both named Thomas Vicars, and natives of Cumberland. 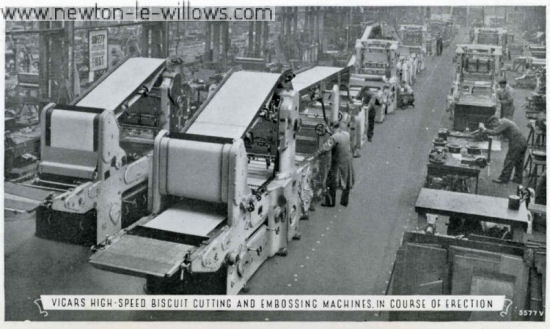 They opened premises in Seel Street, Liverpool, as general engineers, and by 1852 were making machines for cutting dough for the production of ships’ biscuits. They then designed and built a travelling plate oven for baking biscuits and bread. By 1890 the company had commenced to make smokeless stokers and a full range of equipment for the making and baking of biscuits, in which they were now specialists. By the turn of the century they had invented an oven for the baking of wafers, and had introduced a machine which made, and continues to make, a splendid variety of embossed design of biscuits, and is famous the world over. 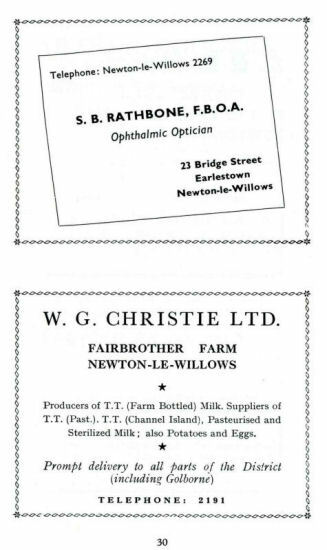 The Vicars partnership changed and became a private limited company in 1925, and designed plant for the continuous production of swiss rolls and developed and perfected a system of automation in biscuit production. In war time from 1939-1945, the whole organization was engaged on government contracts, manufacturing a wide variety of war weapons for all three important services. All this work was executed to a high standard in precision engineering. 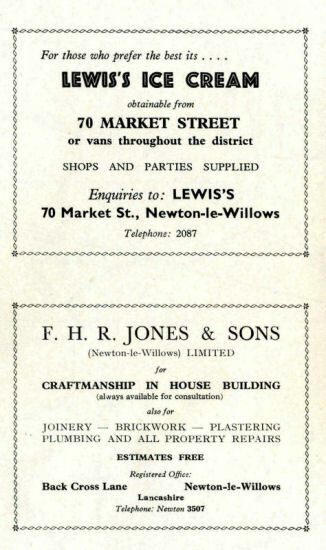 In 1949 was celebrated the centenary of the foundation of the company, and in 1954 the firm of T. & T. Vicars, became what is now known as the Vicars Group of Companies, by taking over R. W. Barraclough Limited, Southport, specialist manufacturers of packaging machinery, and Pelkman Bros. Limited of London, a well-known and old established company specializing in the manufacture of bread-making machinery. Throughout its existence the company has been concerned extensively in manufacturing for the world markets and more recently in developing exclusive lines, including the use of high-frequency and infra-red electrical heating for baking. The company, with its subsidiaries, employs over 1,200 personnel, and has an unbroken record of continuous growth and development. A branch of the raincoat manufacturing firm of Cohen & Wilks Limited, whose headquarters are in Manchester, has been established in the town. 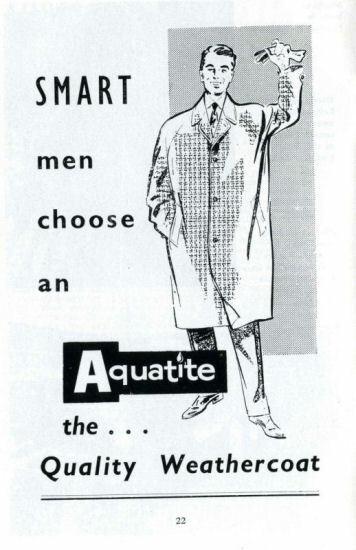 "Aquatite" is the world-famous trade-mark of this firm. The business was founded in 1894 by the late Philip Michael QuasCohen, whose energy and personality expanded it into one of the largest raincoat and clothing manufacturing concerns in the country. The company operate their own spinning, weaving and proofing plants in Bradford and Galashiels in addition to clothing manufacture in Leeds and other Yorkshire towns. 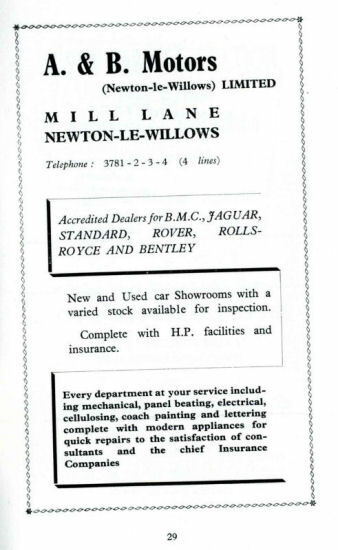 The attractively modern Newton-le-Willows factory, opened in 1946, specialises in the production of "Aquatite" rainwear, tailored gabardines which have a splendid reputation in the home market and in many overseas countries. 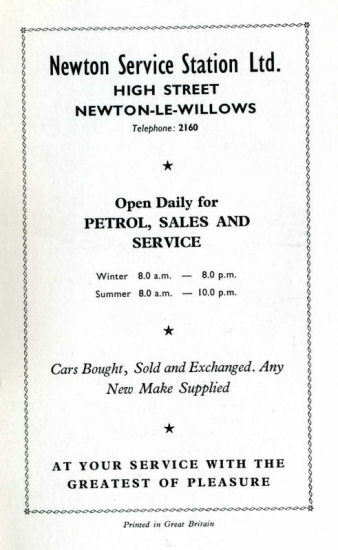 The Newton-le-Willows factory is a model of its kind and visitors are welcome at any time during normal business hours. 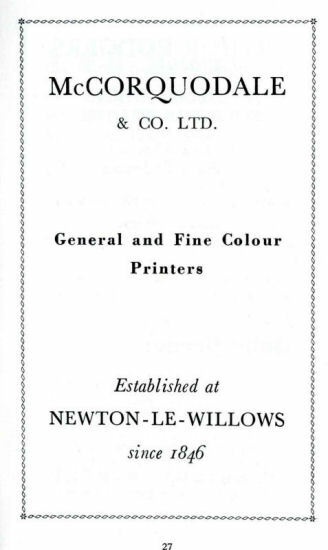 In addition to the older-established important industries in Earlestown, are a large printing works owned by McCorquodale and Company Limited at Newton, where every kind of commercial printing is undertaken. 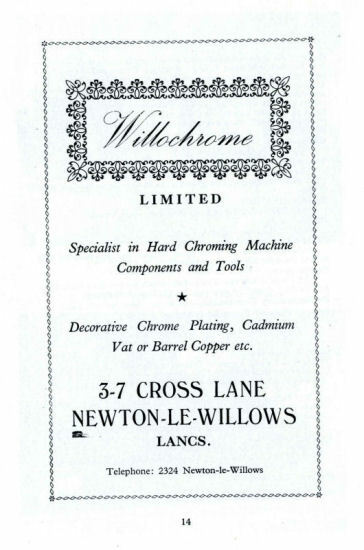 Willochrome Limited, of Cross Lane, undertake decorative chrome plating and also the same type of work in copper and other metals. They specialise in hard chroming machine components and tools. There are a number of other local industries and the Clerk of the Council would be glad to supply information and deal with enquiries. Transcribed from original source, This version and images are ©2006 Steven Dowd.